In this article we will create Custom HTML helper for input type="checkbox" to render checkbox control. First we will create a folder named CustomHelper. 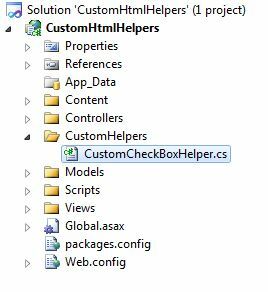 We will include a class file named CustomCheckBoxHelper.cs, which will hold code for Custom checkbox control. //This helper accepts name attribute. This method in turns calls our second overload. //This helper accepts name and isChecked boolean attribute. //This overload accepts name, isChecked and htmlAttributes as parameter. //Creating input control using TagBuilder class. //Setting its type attribute to checkbox to render checkbox control. //Adding the checked attibute based on parameter received. //Merging the other attributes passed in the attribute. Overload 2 : The second overload accepts name and isChecked as parameters. The name is used to set name attribute and isChecked parameter decides whether the checkbox should be checked or not. This overload calls another overload. Overload 3 : The third overload accepts name, value and htmlAttributes object. The htmlAttributes object contains route values passed from the view. In this method we are creating a input element using TagBuilder class. 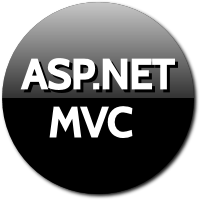 We are setting its type attribute to checkbox to render checkbox. We are also setting name, id and any other attributes passed using htmlAttributes. In the view we are using @html to access our Custom_CheckBox method. As we have three overloads for it we have defined three controls. This is how we can create our own Custom HTML Helper to render hidden control. You can customize the above class to add more features in it. We can customize the overloads to accept list to render multiple checkboxes.